$129.00 In stock. Order in the next 17 hours, 21 minutes and it will go out today! In stock. Order in the next 17 hours, 21 minutes and it will go out today! 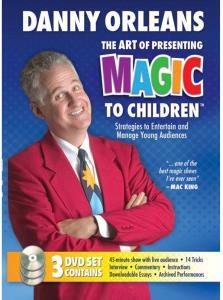 This DVD/ Download set on how to do magic for kids has been recognized by critics worldwide as the best ever produced! Danny Orleans – a former Kindergarten teacher, shares over 40 years of experience performing more than 4000 shows to over one-million children, parents and teachers. This 3-DVD set has over 5 hours of content including Danny's complete 45-minute family show, commentary on audience management strategies, 14 trick explanations, Eugene Burger interview, 10 essays and more! • Watch his entire Family Magic Show, including 8 routines, 14 tricks and 2 bonus tricks. • Hear his dialogue with child communication expert Michael Brandwein, as you watch the show again with them and hear their commentary on the 70 Audience Management Strategies Danny employs. • See Eugene Burger interview Danny Orleans on his Philosophy of Children's Magic. • Learn to make and perform his entire repertoire of tricks, including warm-up, intro and segues. • Enjoy vintage footage of the show that Danny Orleans and his wife and partner, Jan Rose, toured internationally. • Download Danny Orleans' updated essays originally published in industry magazines, Genii, MAGIC and The Linking Ring. Danny, with his wife Jan Rose, has lectured all over the world including FISMITALY2015. Everywhere they go, kids magicians tell them how helpful their kidshow management strategies are. The techniques Danny has created and teaches can be used immediately and will make you an expert on how to handle young children. When the kids are under control, your show can really shine. It will when you watch, learn and implement the ideas on The Art of Presenting Magic to Children. "A wealth of Audience Management Strategies...practical information that can be instantly added to your armory, to improve your shows, and to help ensure your audience's enjoyment as at its maximum." Love the GIANT coloring book! Also like the idea of using a theme related/popular coloring book for the effect. Audience mangement thoughts are excellent including ideas for adults watching a children's show. Effect placement ideas strong as well as variety thoughts. Good points re selecting diverse volunteers. I Have been a semi pro/professional magician since 1958. Experience has proved that these points are very important. Great information for young and experienced performers. This is an excellent set! From being able to watch the show from entering the venue to the actual set up is so helpful. The section on all the points is one of my favorite in this set. These points yes here are for kids but I have taken them and applied them to my other shows of mentalism and even stage hypnosis. This set is helping me cross over in to performing for kids and families. Love the routines and concepts behind why they are there as well. Very clear information and resources. I will add, I have seen some say this is over priced and I will say it is under priced by far. One tip is worth everything here. Book a show or make your show better for rebookings and it already creates that value back and then some. thank you for putting out such a great material and being there for us for questions as well. From Start to Finish Danny guides you through the tricks of the trade (pun intended) in producing a successful show for children. His techniques and suggestions are the stuff that counts in real world performing, if you perform for children then this DVD set is a must, it helped me and I know it will help you.